These days, vinyl covered foam tatamis are most often used for martial-arts practice instead of traditional straw tatamis. The vinyl finish can be rice straw imitation for a better grip, or smooth, depending on your preference. Many colors are available. The standard dimensions for these mats are 1m x 2m and 4cm thick, however they are also available in 1m x 1m squares, but generally only used to complete a surface. Each tatami weights, about 18.5 kg (40 pounds), so its important to plan for an adequate method of transportation and avoid any unpleasant surprises that may arise from improper manipulation. We will be happy to organise professional shipping for you. Durability: It is not unheard of to have tatamis last over 20 years. This however depends on the type of wear they are subjected too. If a tatami has been accidentally damaged or ripped, or if there is excessive or premature wear (such as by the entrance for example), such a tatami can easily be replaced. 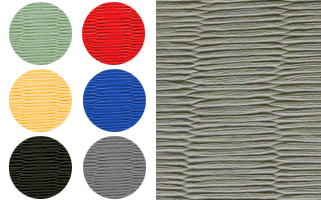 Jukado is an authorized distributor of Agglorex tatami mats, in America, for over 40 years. Our tatamis mats are made in Europe and they are approved by the International Judo Federation. They set the worldwide standard for tatamis-mats. Rice straw imitation vinyl (replicating traditional straw mats) is a textured surface ensuring minimum grip even when there is sweat. Smooth vinyl finish minimizes carpet burns, which tends to be appreciated for ground fighting, however it can become pretty slippery when there is sweat. Rice straw imitation is the standard for judo and traditional arts. The BJJ and MMA community tend to be divided weather to use smooth or traditional finish. Since the durability of both surfaces is the same, it is really a question of personal preference. 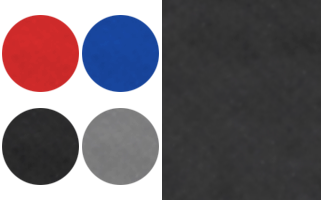 Although the color of the vinyl is the same, the difference in texture tends to reflect the light differently, which can make the traditional finish appear darker. The main core and interior of the tatami mat is made of one single piece of 100% high quality rebounded polyurethane foam. This high quality foam has an excellent memory, so it can be compressed thousands of times and still preserve its shape and density over the years. 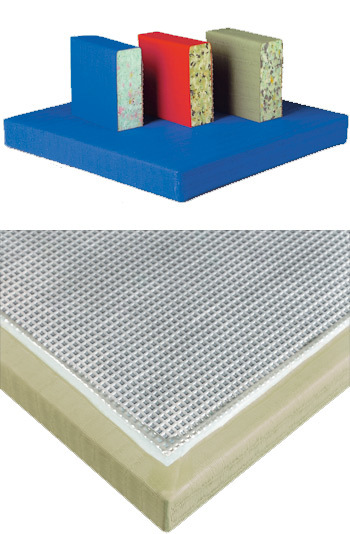 The rebounded foam also ensures uniformity of firmness throughout the mat. In addition, the quality of the foam is such that shrinkage is almost inexistent. Should the shape of the mat change, it would become almost impossible to lay them properly and avoid cracks (i.e., spacing) between the mats, which unfortunately may happen with lower quality products. The density of the foam can vary; however, it is not indicative of quality. Standard density for the International Judo Federation is 230kg/m3. 200 kg/m3 Medium density mats – used for children or ground fighting. The foam tends to be too soft for stand-up training of adults. Medium density mats are only available for special orders. 230 kg/m3 Standard density mats - designed to absorb breakfalls in Judo practice and other Martial Arts. These mats are the perfect balance between absorptions and stiffness required for stand-up training. These mats are usually produced in 4cm thickness and readily available. International Judo Federation sanctioned events require 5cm thickness, which can be produced for special orders. 270 kg/m3 High density mats - design to absorb heavyweight breakfalls. 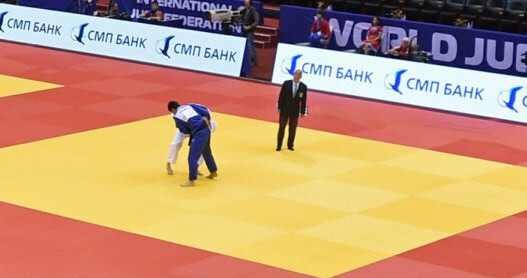 These mats are firm and generally only used in international competitions such as the Olympics, or in law enforcement facilities. They are usually produced only in 5cm thickness on special orders. The top and sides of the mat are fully laminated with a strong and hygienic vinyl. The corners are hand-cut and sealed by hotmelt welding. This process is key to preserve perfectly rectangular shape of the mat. Lower quality mats may have excess vinyl in the corners which results in irregular shapes. Although these variations appear to be minor, it becomes almost impossible to lay the mats down without creating cracks which can result in injury. A waffle like anti-skid rubber is then laminated as under layer to prevent the mat from moving. The rim of the anti-skid rubber is hand glued and reinforced with hotmelt welding for more durability, as this is the weakest part of the mat. 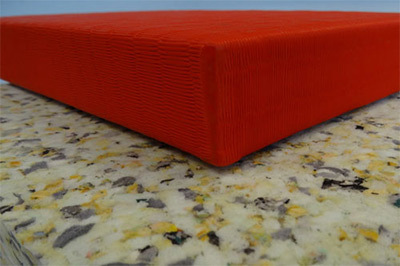 The large anti-skit rubber surface combined with the tatami’s weight ensure minimum displacement. Jukado mats are high quality product produced by Agglorex in Belgium. The modern production line and culture of excellence results in a perfect finish and correct size, meeting the more severe specifications for safety, comfort and durability. In order to avoid the accumulation of dust, which can eventually stick to the surface of the vinyl, or result in respiratory issues or allergies, we recommend to sweep the tatami-mats every day. In several dojos, this task is delegated to the students, so they learn discipline. This also strengthens their attachment to the group and the club. Traditionally, cleaning is done after the last class of each day, so as to leave the dojo respectfully and clean for the next people to train. It is recommended to wash the tatami-mats twice a week in order to remove any organic debris and disinfect the surface. More frequent washing might be necessary depending on use. Firstly, it is recommended to wash the tatami-mats with a mop and soft soap (which does not damage the vinyl) in order to remove any organic debris (e.g. hair, skin, etc.). To avoid accelerating the deterioration of the vinyl, it is crucial to use soft soap that does not leave a film on the surface and that has neutral Ph. If the soap is not disinfectant, it is recommended to disinfect the surface using a solution having a javel water to water ratio of 1:10. This should kill any bacteria or fungus. Javel water must be used with care, because it can damage the vinyl if used in higher concentrations. Even though tatamis mats are covered with vinyl, they are not waterproof. Hence, they should never be damp, and one should never leave any water puddle on them. Any excess water will penetrate into the tatami-mat, thereby damaging the interior. The vinyl may unglue itself from the foam, which weakens the mats greatly. Stagnating water is susceptible of damaging the vinyl. Furthermore, humidity contributes to the development of fungus. If the mop is too humid, excess water can run between the tatamis mats. This should be avoided; otherwise fungus can grow resulting in odors or even health risks. If excess water reaches the under-mats, it might rotten slowly over time, as the humidity cannot escape easily because of the tatami-mats being on top. Any soap that is not soft or neutral may contribute to the deterioration and early aging of the vinyl. Polishing products, wax, detergents or solvents, as they can harden, damage or rip the vinyl. An electric floor cleaning machine. They can be used on most linoleum, but never on vinyl mats. It is recommended to remove all the tatamis mats twice a year in order to clean the floor or under-mats. Generally, there is an accumulation of dust, so it is usually better to vacuum before washing and disinfecting. It is also a good time to clean the sides of each tatami-mat, which are difficult to clean on a regular basis. In many gyms, it is a great opportunity to make members participate to a group activity. In order to make re-assembly easier, we recommend to draw a plan of the tatami layout and number the mats (on the anti-skid side). Tatami mats are heavy and must be handled with care. We work with several professional freight forwarders to guaranty a fast and efficient delivery across Canada and the United States. Furthermore, our European installations allow us to ship across Europe very efficiently and with minimal delay. 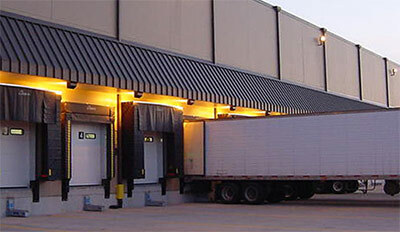 We can also ship to our forwarder’s warehouse, so you can pick up your mats and save on shipping costs. 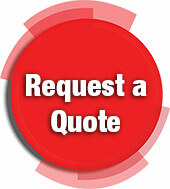 Our professional sales team will work to find the best shipping rates for you and meet delivery deadlines. Jukado manages the freight forwarder and any importation taxes, duty or documentation required for importation. Our tatami-mats are delivered at your doorstep as if you had purchased from a local supplier. Although we ship our tatami-mats across the world, there are delays due to transport by sea. It is best to discuss with our team in order to coordinate your personalized delivery. The vinyl and rubber anti-skid layer are laminated onto the rebounded polyurethane foam. Hence, any time the tatami is bent or twisted, the vinyl and anti-skid layer are likely to detach from the foam. They cannot be glued back or repaired. Bending the tatami may result in wrinkles or creases on the surface of the vinyl, peeling of the vinyl from the foam, or un-gluing of the anti-skid layer. Any wrinkle will tend to increase over time resulting in premature aging of the mats. For this reason, it is imperative to follow certain guidelines to ensure that your mats have a long and healthy life. 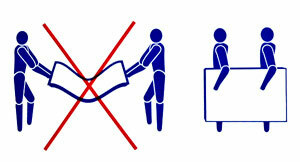 Never carry a mat so that it folds or twists and always carry it vertically, preferably with two people.